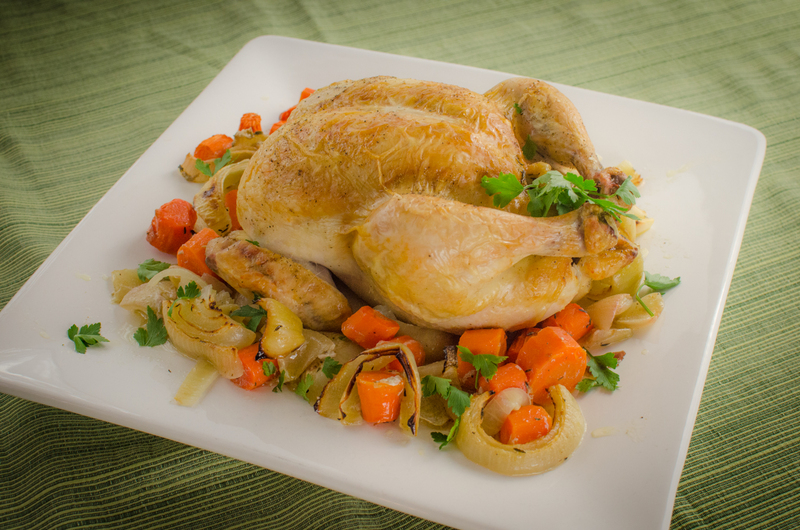 My mom and I made this roasted chicken a few nights ago – and we all devoured it! It’s full of flavor, and the veggies soak up all the juices from the chicken, lemon, and garlic. MMMMMMmmmmmmmm. 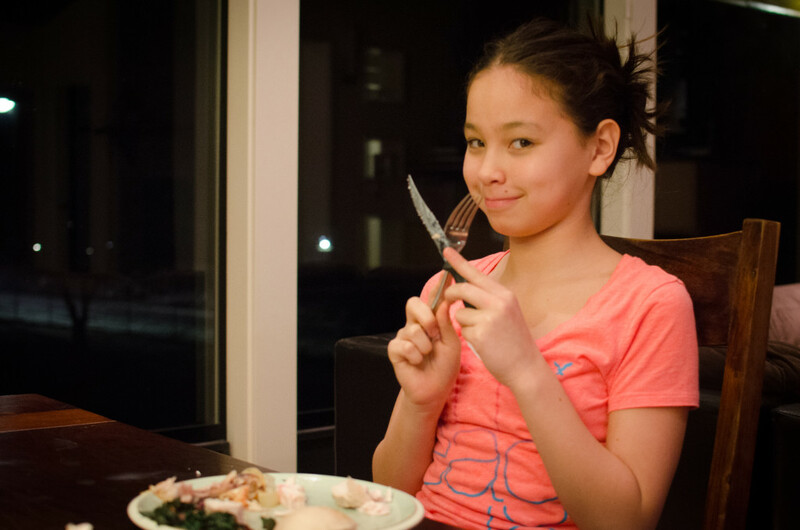 We served it with Sauteed Greens with Kale, Chard, and Garlic -another easy recipe. Tender, juicy, and delicious, it's perfect for a winter's night. Your whole house will smell awesome! Any other root veggies you like to roast, such as potatoes, fennel, sweet potato, and parsnip can be added or replace the carrots and onions. Remove the chicken giblets. Rinse the chicken and pat the outside dry with paper towels. Salt and Pepper the inside of the chicken, and then add the lemon, garlic, and thyme. Brush the outside of the chicken with butter and sprinkle again with salt and pepper. Tie the legs together with kitchen string and tuck the wing tips under the body of the chicken. Place the onions and carrots (or any of your favorite root veggies) in a roasting pan. Toss with salt and pepper. Add about a quarter cup of water to the pan so the veggies don't burn. Spread the veggies in a single layer, and place the chicken on top. Roast the chicken for 1 to 1-1/2 hours, or until a thermometer inserted into the meaty part of the leg (avoiding the bone) reaches 165°. Remove the chicken and vegetables from the oven, cover with foil and let it sit for about 10 minutes. 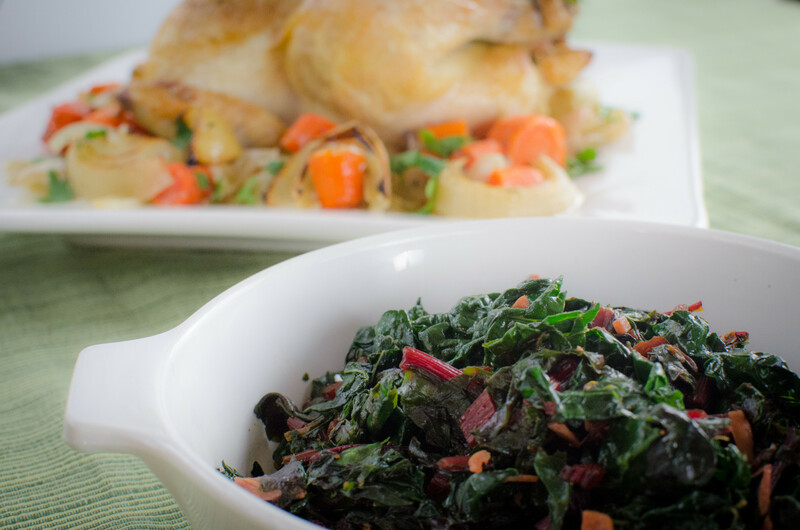 Arrange on a platter and serve with Sauteed Greens with Kale, Chard, and Garlic and a fresh salad. Did you baste the chicken at all while it was cooking? No we did not, but you totally can!